United Nations, New York, USA, June 08 2018 – Photographer Chris Jordan during a panel discussion held on the occasion of World Oceans Day. The discussion highlighted the important roles of youth and innovation in addressing solutions towards cleaning our oceans today at the UN Headquarters in New York City. 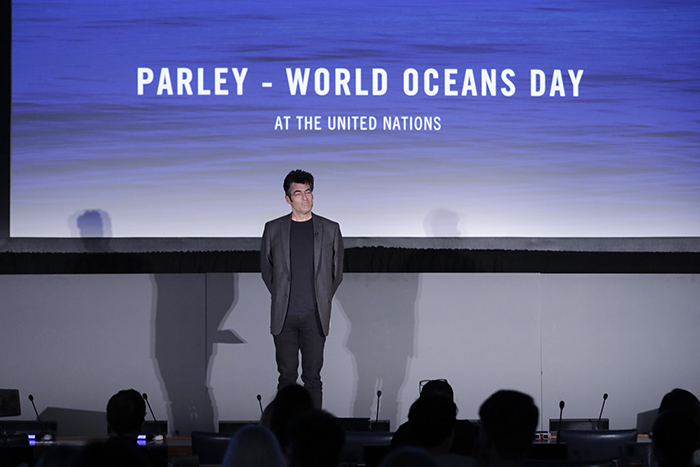 When the United Nations celebrated World Oceans Day on June 8 there were speeches but also a presentation by Parley about how ocean plastic is being used to make athletic shoes, credit cards and even luxury brand sunglasses. In an event attended by former UN President of the General Assembly Peter Thomson of Fiji, Parley showed photographs of beaches covered in plastic waste. While officials like Secretary General Antonio Guterres have committed this week to phase out the use of plastic water bottles, Parley says that is not enough. The existing plastic waste out there in the ocean must be dealt with and must be re-used. It is a revolution. Parley showed photographs of beaches entirely covered with plastic detritus. They say, Plastic was good to us, but plastic has got to go. New designs are being sought. UN Secretary General Antonio Guterres, who committed this week to no longer use plastic water bottles in his office on the UN’s 38th floor, said that “On this World Oceans Day, we are highlighting the problem of plastic pollution. Eighty per cent of all pollution in the sea comes from land, including some 8 million tons of plastic waste each year. It chokes waterways, harms communities that depend on fishing and tourism, kills turtles and birds, whales and dolphins, and finds its way to the most remote areas of the planet and throughout the food chain on which we ultimately rely. Unless we change course, plastic waste could soon outweigh all the fish in the oceans. And Parley is doing that and more.